When was the last time you heard the following story on national news: today, a truck transporting solar panels overturned on a highway spilling them into a river? I'm pretty sure the answer is never. That is because, at most, it would be a local news story for causing a traffic jam. The conclusion of that story would be that crews pulled the solar panels out of the river, dried them off, and took them to their destination, where they provided clean, free energy to a neighborhood for many years to come. The story is very different when it comes to fossil fuels, which, in addition to being dirty during extraction, combustion and disposal, can violently disrupt our communities during transport. Over the past year, we have seen a remarkable increase in fossil fuel transport disasters. And when fossil fuel transport goes wrong, it goes wrong in a big way. 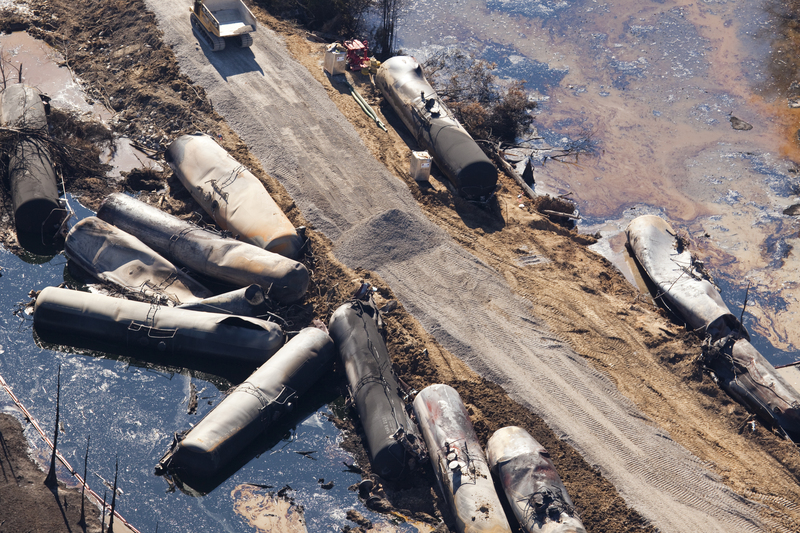 Quite often, these disasters involve crude oil that is extremely dangerous and volatile and that is transported via railways that run next to or over our nation's waterways. This unnecessarily threatens drinking water supplies, recreational resources, and the health and safety of our communities. Recent examples abound: In July 2013, a train carrying oil from North Dakota lost control in Quebec and the resulting explosion killed 47 people. 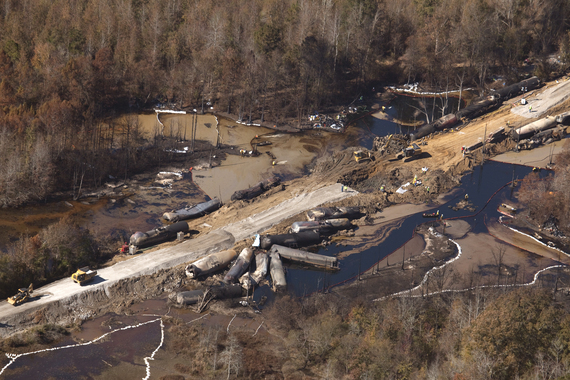 In November 2013, a tanker train hauling 2.9 million gallons of Bakken crude oil derailed into a west Alabama swamp, devastating the community of Aliceville. Shortly after that, a train derailed in Casselton, ND, prompting a "strongly recommended" evacuation of residents. In April 2014, a train carrying Bakken crude derailed into the James River, causing hundreds of people to be evacuated from downtown Lynchburg, VA. That is just a small sampling of how the fossil fuel industry puts our communities at grave risk transporting such dangerous, explosive cargo. According to Politico, there were 132 oil train incidents from 2009 to 2012; 118 incidents in 2013; and already 70 just through the first five months of 2014. Even as these disasters become more frequent, the industry pushes for increased oil transport, including a proposal in New York to turn the Hudson River Valley into a virtual pipeline of crude oil transport by rail and vessel. Why should our communities be forced to allow these DOT-111 "bomb trains" - so called by rail workers due to their inadequate safety measures combined with crude oil's volatility - to go through their communities by rail? The answer is, they shouldn't. After the Exxon Valdez disaster, and despite industry protest, the Oil Pollution Act of 1990 required oil tanker ships to be double-hulled. While double hulling may not have prevented the Valdez disaster, it likely would have dramatically reduced the amount of oil spilled. The National Research Council estimated that double hulls would reduce spills from groundings by 85% and from collisions by 50%. The acceptable level should be 100%; fortunately, we haven't had a major tanker spill since the double hull requirement. However, we now allow dangerous bomb trains to run right through our communities, without the adequate precautions from the agencies that are supposed to be looking out for our public interest. As a result, disasters like those referenced above are increasing in frequency. The National Transportation Safety Board has acknowledged that DOT-111s are easily ruptured during accidents. After the Quebec disaster, the Canadian government ordered 5,000 DOT-111 trains to be removed from service and for 65,000 other cars to be either removed or retrofitted within 3 years. The US DOT also acted in May 2014, but with too little, too late. The Agency's emergency order requiring railroads to notify state emergency management officials before moving large shipments of crude oil through their state only applies to trains carrying 35 cars or more of Bakken crude oil. A requirement covering all rail transport of crude oil would be more transparent and best protect first responders, the general public, and the environment. Even better would be a mandatory removal of DOT-111 "bomb trains" from service, until the industry proves it can transport oil safely. As it stands now, the order does not do enough to reduce the risk of future derailments. Of the 92,000 bomb train cars currently used to transport flammable liquids, only 14,000 meet the latest safety standards. It cannot be acceptable to have 85% of train cars in service not meeting the latest safety standards. These bomb trains need to be stopped until the industry makes essential safety improvements. This transport of crude oil puts at risk our communities and the waters we use for swimming, drinking, and fishing. The railways need to learn from the Exxon Valdez spill and put in place preventive measures to protect the environment before we see the rail equivalent of a Valdez disaster. Congress and regulatory agencies like the US Department of Transportation need to step in and stand up for communities and waterways to protect them from these disastrous bomb trains. I encourage you to contact your elected officials and demand the oversight that we all deserve - and that we desperately need.